I never met my father's father, as he died many years before I was born. 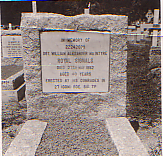 He was a soldier in the British Army and was killed in an accident in Burma in the 1950s. I'm told that back then the Army did not repatriate casualties as a matter of course like they do today, so none of the family got to see his funeral or even visit the grave. 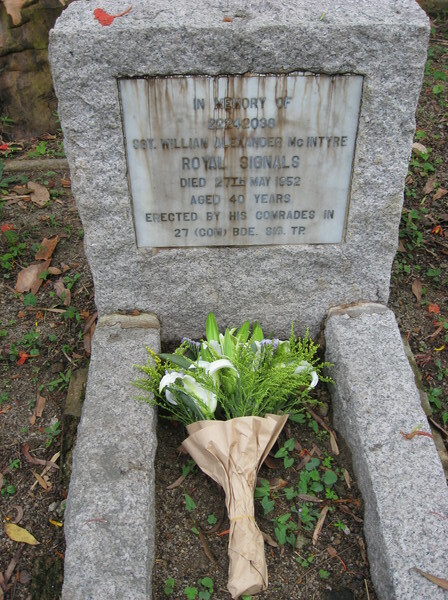 Like many of the military casualties in the Far East, he was buried in the Colonial Cemetery in Hong Kong. 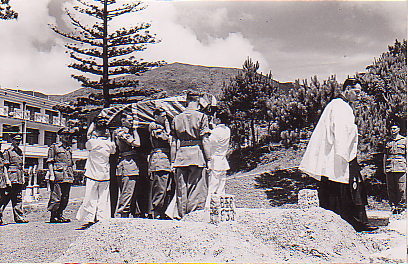 A few photographs were sent to my grandmother of the ceremony and the headstone, but that's all we ever saw. Fast forward to 2012. I travelled to Hong Kong for a conference (Linaro Connect, more about that later...). I looked up the details of where grandad was laid to rest, and found a major coincidence. 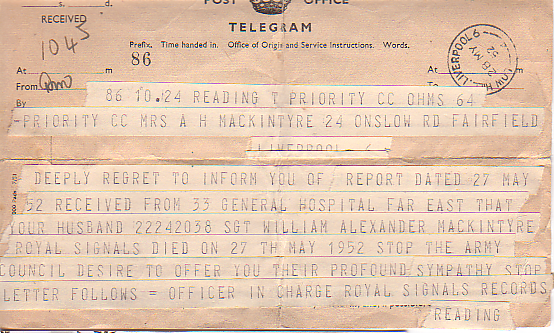 He was killed on 27th May 1952, almost exactly 60 years ago! I resolved to go to find him on 27th May 2012 to make the most of this lucky anniversary. 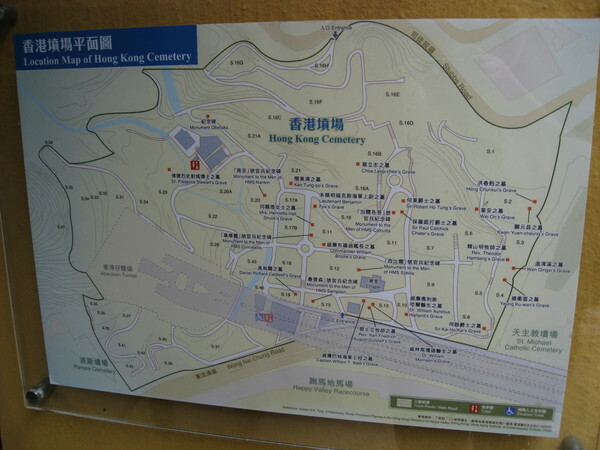 Wikipedia told me that in the intervening years the Colonial Cemetery had been renamed to Happy Valley Cemetery, then simply Hong Kong Cemetery, and repurposed from military to civilian use. Jo and I bought some flowers and headed over to Happy Valley on Hong Kong Island on Sunday afternoon. We found a very large cemetery with a helpful map posted to show the different sections, but nothing to tell us where we should be looking. One of the attendants at the office on site looked at the details we had and shrugged to say "sorry, can't help". Ah well, nobody said this was going to be very easy... What we found after a few minutes was that the graves weren't laid out in any obviously logical fashion. In any given small area, you'd find people buried from roughly the same period, but people for any given period could (and would) be scattered across multiple sections at all corners of the site. Great, time for an exhaustive search then. I started combing the site, checking all the markers I could find that looked anything like the tiny grainy black and white photo we had of grandad's headstone. Almost two hours later, I eventually found him. Two hours of heavy work: the cemetery is built on the side of quite a steep hill, and the prevailing weather was very hot with 100% humidity. But, I forgot all that as we eventually stumbled across the correct grave in (no exaggeration!) the very last part of the last section of the site, 20a. I was relieved at this point: as things had taken so long, I had started to worry that maybe the grave had been moved or the headstone damaged and lost. But no, I found the man who had gone off to war leaving my dad and aunt as small children. We took some photos and took note of where we had found the final resting place of Sergeant William Alexander McIntyre of the Royal Signals, a man I never met in life but clearly a very important member of our family. Very appropriate: respect for your family amid a culture which values that very highly. I'm glad you were able to find your grandfather and pay your respects - and also glad that you got to see Hong Kong. I was pleasantly surprised at how well things were maintained, to be honest. The photo is of the grave as we found it, with our photos added. I had been naively hoping that there might be a list showing where each grave was, but I can also understand how much effort that would be!